In January 2016, six months after Kerry Mraz, 38, moved to Houston for his wife’s new job, his marriage ended and he found himself unmoored in a city he barely knew. While walking one day in a park near his home, he met a neighbor, who invited him to church -- at a Taco Bell. The next Wednesday, at 7:30 a.m., Mraz went to Taco Church, where a small group of men gathered for breakfast, Bible study, jokes and prayer. The group, started by an Episcopal priest and a few guys from his gym, shared vulnerability in a way that Mraz had rarely seen. Sometimes he had to step outside the fast-food restaurant to cry. The priest, the Rev. 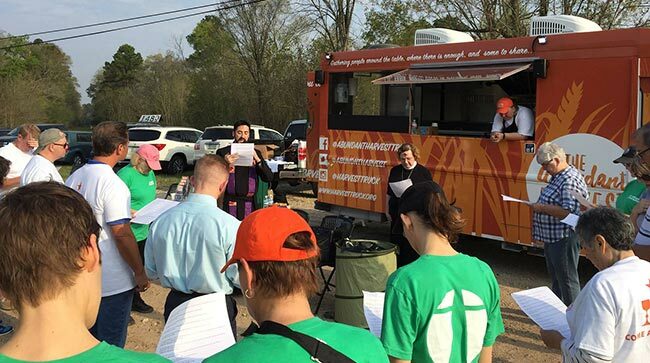 Sean Steele, told Mraz that Taco Church was part of the newly launched St. Isidore Episcopal, a “church without walls” focused on small group discipleship and community service. The church didn’t have a building, and it didn’t want one, Steele said. Instead, it had a cellphone app, linking members to the church’s many parts. What “stuff” are people in your community seeking? How likely are they to find that at your church? 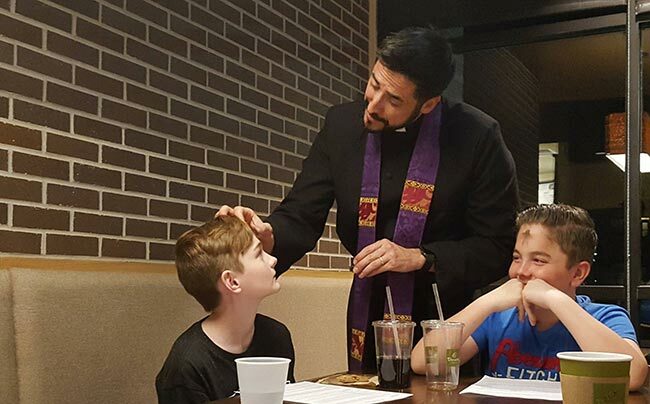 This Easter, a little over a year after his first Taco Church, Mraz and his 6-year-old son were baptized in a service he helped organize as a member of the St. Isidore leadership team. The Rev. Gerry Sevick, the rector at Trinity, hired Steele straight out of seminary in 2012 with the understanding that he would eventually plant a new church or start a missional community. Steele brought an unusual set of skills and life experiences. The University of Texas finance graduate joined Enron six months before it collapsed in 2001 and, during college, briefly explored a call to the Catholic priesthood. After studying systematic theology and doing social justice work, Steele discerned a call to the Episcopal priesthood. In May 2012, he received his M.Div. from Austin’s Seminary of the Southwest. Along the way, he and his wife, Becky, had three children, whom they homeschool. By the time Steele reached Trinity, the self-identified “misfit” knew he wanted to nurture a church community that catered to the unchurched. Sevick, a former social worker, was supportive. So was their bishop, the Rt. Rev. Andy Doyle, who’s written about missional communities. 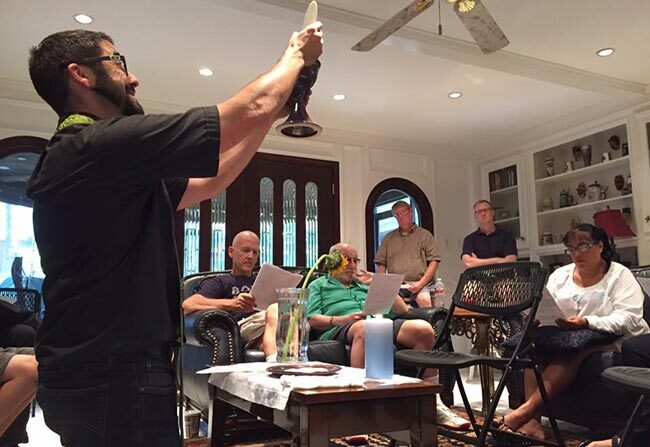 Starting in January 2015, Sevick gave Steele 10 hours a week to focus on research, dreaming, planning and working with a church-planting coach -- a luxury possible perhaps only at a large multi-staff parish. After working through a series of check-in questions, the group studies a parable. They share wisdom across generations, poke fun at each other and break bread -- specifically, breakfast tacos and some Chick-fil-A sandwiches sneaked in for variety. A few months in, one of the members asked the others where they attended church. Since then, Steele has introduced more liturgical elements, such as the Lord’s Prayer and a confession. Steele said other pastors can start similar ministries that recognize the sacred among the profane, piggybacking on moments already imbued with meaning. 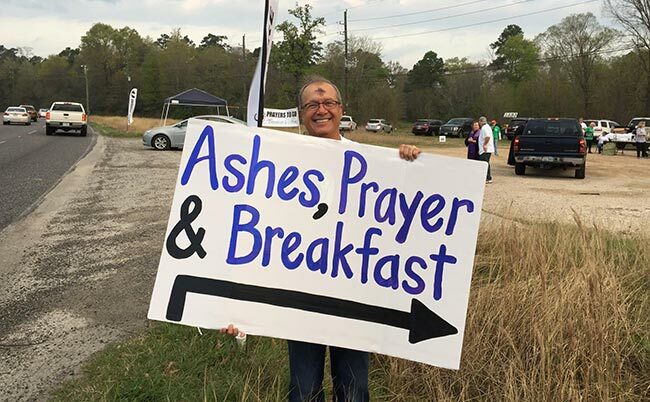 Where are “sacred gatherings” and “moments imbued with meaning” happening outside of church in your community? How can they become seeds of new ministries? The Rev. Sean Steele celebrates Eucharist at one of St. Isidore's two house churches. Steele was also willing to make mistakes and learn from them. A third house church, aimed at millennials, fizzled over seven months as several members moved away for work. For Steele, death is an essential part of a Christian community, and church leaders need the courage to let some projects die. What ministries, if any, in your church are on life support? What would it take to let them die? In February, they launched another experiment, Warrior Church, which meets at a boxing gym on Sundays at 7:30 a.m. After Steele leads a short Episcopal service, Greg Fleischman, a personal trainer, leads the eight or so participants through a 40-minute workout. “I never really liked church, and I never really liked working out,” said one participant, Rocky Snyder. But to his surprise, the combination works at Warrior Church. The session, aimed partly at military veterans, includes resistance bands and barbells -- and swinging a sledgehammer against a tire, an activity that Snyder called his version of confession. One of the busiest programs at St. Isidore, Laundry Love, brings together participants from the church’s many parts. Held the second Sunday of every month since early 2016, the event -- part of a national Laundry Love network -- offers free laundry, groceries, haircuts and health checks. About 9 a.m. on Palm Sunday, the first volunteers in green St. Isidore T-shirts descended on a laundromat in a nondescript strip mall. Fittingly for Houston, the country’s most diverse major city, the laundromat is owned by Hindu immigrants who rent out the facility to host a Christian service in English and Spanish. 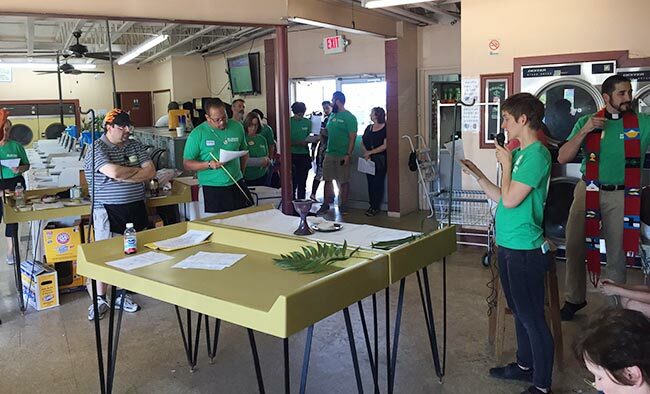 Clad in green T-shirts, St. Isidore members celebrate Palm Sunday in a Houston laundromat. A few volunteers prepared the food truck, which on a busy Sunday serves as many as 200 meals. Others set out bags of free groceries and arranged a kids area with donated toys and books. A nurse began checking blood pressure and blood sugar, offering referrals to a nearby free clinic. “This is so easy, and you get church, too,” said Litha Island, 51. The single mother said she could do laundry at her godmother’s place but didn’t want to run up the utility bills. Later, Suzette Harrigal walked in with a bundle of blankets and looked confused when Judy Ryan, a volunteer and founding St. Isidore member, offered her free quarters for her laundry. “We’re here to help the working poor, and we have a church service,” Ryan explained. Ryan said she signed up for St. Isidore after she found her mind wandering to grocery lists during traditional church services. She participates regularly in a house church, Laundry Love and Pub Theology. Churches must recognize that today’s Christians assemble their own discipleship routines from a buffet of options, Steele said. Instead of committing to one church and its activities, someone might attend a house church, do service projects with the YMCA, listen to a Baptist podcast and read a nondenominational pastor’s books. It’s a model that doesn’t require an exclusive relationship with one church community, either in time or in money. In what ways does your church expect an exclusive relationship with members? Is “streaming” a threat or asset to its ministries? Vazquez, for example, participates in Laundry Love even though it’s not tied to his own church, because he sees a need to reach out to people who aren’t in the pews on Sunday mornings. “If people don’t go to the church, let’s go to the people,” said Vazquez, a Cuban refugee who has also shared his faith journey with St. Isidore’s small youth group. It was such generosity that attracted Pat Snyder to St. Isidore even though he wasn’t a Christian. Now the coordinator of Pub Theology, Snyder adhered to the ancient Chinese religious philosophy of Daoism. After his retirement-project chicken farm flooded last year, Snyder was stunned when Steele and 20 others arrived to help clean up. Snyder was so perplexed by their kindness that he got involved, too, and says he might be tilting toward Christianity. Around 12:45 p.m. on Palm Sunday, the Laundry Love group gathered for a service complete with palm fronds. Over the din of washers and dryers and a soccer match playing out on the wall-mounted televisions, Steele led a partly bilingual Eucharist with the elements laid out on the laundromat’s folding tables. Clearly, a church like St. Isidore requires a high-energy priest who can juggle multiple tasks and hold everything together. Steele fills the bill. Sevick said Steele has an entrepreneurial mindset and financial acumen that’s ideally suited for St. Isidore. The Rev. Sean Steele imposes ashes on members of St. Isidore's youth group, which meets in a Panera Bread restaurant. “He’s able to go in and start from the ground up and build from nothing, be a cheerleader and bring other people on board to make it successful,” Sevick said. But St. Isidore’s existence doesn’t depend entirely on Steele. Laity also play a strong leadership role. Steele attends Pub Theology only twice a month, and one house church usually meets without him. Even so, Steele’s pace seems exhausting. Last year, he had only 10 days when he didn’t do anything related to the church. “Church planting means sleeping when the baby sleeps,” he said. As the church becomes a toddler, Steele has introduced boundaries, trying to take off Mondays and Fridays, and reserving Thursday evenings for family time. St. Isidore still relies on Trinity for financial support and other resources, including Steele’s salary, office space, administrative staff and volunteers. Steele remains on the Trinity staff, preaching quarterly and meeting with Sevick every month. But he’s also diversified his funding with grants and support from other churches and individuals. Steele hopes that St. Isidore can be financially sustainable in a few years, operating on a projected budget of only $150,000. He envisions the money coming from 10 groups of 15 members, each contributing an average of $1,000 a year. The grand experiment has benefited both Trinity and St. Isidore, both pastors said, but it might not be right for every church. The project’s scope might overwhelm smaller churches, but many congregations can replicate some of its elements, Sevick said. “House churches can be formed by any congregation if they have trained leadership and know where the population is that’s looking to express their Christian faith outside the traditional bricks and mortar,” he said. But churches wanting to try need to be comfortable making mistakes. They should also have a “tolerance for the awkward” and a mindset that values intentions over results. Even if St. Isidore benefits only one person in the long run, Steele said, he will be happy. “The call is to be faithful, not successful,” he said. What “stuff” are people in your community seeking? How likely are they to find it at your church? What is the difference between “doing something old in a new way” and “doing something brand-new in an old way?” Where does your church fall on the spectrum of new and old programs and new and old ways? What are the thresholds to your church? How accessible are they? How can they be made easier to cross? Where are “sacred gatherings” and “moments imbued with meaning” happening outside of church in your community? How can they become seeds of new ministries for your church? In what ways does your church require an exclusive relationship with members? Is “streaming” a threat or asset to its ministries? How so?